I read a lot of classics when I was a kid. The majority of them were set in Victorian England, either in the London or in some country manor house. In some ways, these kinds of settings become a comfortable standard; the idea that the characters will find secret passageways or discover the answer to some longstanding family secret is a given, and you can sit back and enjoy the rest of the details, knowing that something will be solved in the end. The protagonists are typically children who are either orphaned and sent to live with distant and aloof relatives, or children whose parents are far away for some reason and as a result are in the clutches of someone less than desirable. 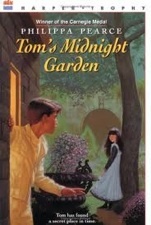 Philippa Pearce's novel Tom's Midnight Garden turns most of these tropes on their heads. The book is set in 1950s England, in a block of flats, and Tom – our child protagonist – is staying with his doting aunt and uncle. Tom is staying with his aunt and uncle because his brother got measles. And, worst of all, he is sent away at the very beginning of the summer holidays. His parents' home has a big back garden and he had all kinds of summer projects and adventures planned for it, but his aunt and uncle live on a second-floor flat, in a building without a garden, and he is confined to inside because he might be contagious. For an 10- or 11-year-old boy, this may as well be a prison sentence. After a few days of dismally poking around and basically sulking that he isn't at home, Tom is lying in bed one night wide awake when he hears something strange: the grandfather clock in the downstairs entry hall, which is notoriously confused about the time, strikes 13. This is beyond any of Tom's experience. The clock often strikes the wrong hour, but never has it struck an hour that doesn't exist. Naturally, Tom decides to investigate. He heads out of the flat, quite quietly, and down the stairs. The hall is dark, though, so Tom goes opens the back door to get a better look at the clock, whose hands point to midnight, like they ought to. A bit disappointed, Tom heads back to close the door when he gets a glimpse of a huge garden. Jackpot. Tom starts spending every night in the garden, a past time aided by the discovery that the time he spends in the garden is negligible in the apartment – hours spent climbing trees and exploring all the different areas don't even rack up minutes in the upstairs world. Now, after weeks of languishing inside, eating rich meals and getting no exercise or fresh air, Tom can play outdoors all night long and not even lose sleep. Things improve further when Tom meets Hatty, a little girl who is also in the garden, and the only person there who seems able to see Tom. Strangely, although Tom can climb the trees and walk around, he is unable to leave any kind of trace in the garden, or open any of the gates or greenhouse doors. He is, in a way, like a ghost. He and Hatty actually get into a fight about that. She says he must be a ghost because he is dressed so strangely (in his pajamas) and only appears every so often; he declares that she must be a ghost because she is dressed in old-fashioned clothes. Hatty also ages much more quickly than Tom, and although he visits the garden each night in his own time, the seasons change and she grows older at a rapid rate. Although their friendship began with him as the older child, soon she passes him in age. Just when you begin to wonder whether it's all a dreamland of a bored child, winter in the garden arrives and Tom makes Hatty promise that when she leaves the house she will hide her skates under the floorboards in her bedroom, which he has discovered to be the same room he sleeps in. The next morning he checks the space under the floorboards and, voila, skates. Hatty is, or at least was, real. Tom's Midnight Garden plays a lot on Victorian stories about lonely children and ghostly encounters, but it does so while harnessing the angst of a bored and confused 20th century boy. The two halves of the narrative – split between Tom's days and nights – tell a kind of coming-to-age story that is more about Tom coming to understand how the world changes and moves on than about him falling in love. Of course, the mystery of the garden is solved in the end, but the night that Tom goes to find it and it isn't there waiting for him is truly devastating. He is heartbroken that the garden isn't there, and his realization of the truth – and reunion with the real-life Hatty – is as joyous as the earlier scene is disastrous. Pearce is a subtle writer, and although this is a story aimed at children, what she says about our secret desires and how we feel when things don't work out is as applicable to adults as kids. Tom needed the midnight garden, just as Hatty – who grew up to be the old woman who lives upstairs – needed to relive her childhood memories, which made the garden real again. The story is a relatively simple one, but it's honestly and unguarded emotion are enough to draw you in. Much like both Hatty and Tom, Pearce's vision of a midnight garden is somewhere you will want to revisit again and again. I still re-read this one, mainly because I love the garden so much! I, too, still own a copy of this. Always adored it! i just finished reading it yesterday! it was wonderful!